We are delighted to share that the Atlanta Metro Export Challenge has announced DDM Systems as a top five finalist. This grant challenge is powered by Chase Bank and designed to help small- and medium-sized businesses begin or expand their exporting programs. Narrowed down from a pool of 14 semifinalists, DDM Systems and the four other contestants will be part of a public voting phase, which began on Aug. 23. Click here to vote for us! At stake is up to $20,000 in grant funds, which would enable DDM Systems to pursue export activities in Europe through exhibiting at a key trade show, scouting trips for an overseas office location, and advertising in local trade journals. Ambassador Charles Rivkin, US Assistant Secretary of State for Business and Economic Affairs visited DDM Systems with Ambassador Charles Shapiro, President of the World Affairs Council of Atlanta. Earlier in the day, Ambassador Rivkin gave a presentation on the Trans-Pacific Partnership (TPP) at a breakfast meeting organized by the World Affairs Council of Atlanta. Georgia Tech Research Horizons Highlights DDM Systems Nomination to the 2016 HERMES Award. Dr. Suman Das with US Secretary of Commerce Penny Pritzker during Georgia Tech'sSpring 2016 Commencement ceremony. Hannover, Germany and Chicago – Atlanta, Georgia-based DDM Systems' flagship ceramic production tool, the LAMP™ System CPT6060, has been selected as one of 5 nominees for the 2016 HERMES Award presented at HANNNOVER MESSE 2016, the world’s largest industrial technology event. DDM Systems is the only company from the United States to receive this prestigious international industrial award nomination. The 2016 HERMES Award is given to first-time exhibitors whose products showcase technological innovation, industrial productivity, environmental sustainability, and economic and social impacts in the global industrial automation field. The award will be presented at the HANNOVER MESSE 2016 Opening Ceremony in the presence of President Barack Obama and German Chancellor Angela Merkel on April 24, 2016. DDM Systems was founded in 2012 by Dr. Suman Das and Dr. John Halloran, Co-Principal Investigators for a U.S. Defense Advanced Research Projects Agency (DARPA)-funded Disruptive Manufacturing Technology (DMT) project that began in 2007. This collaboration culminated in the invention and optimization of Large Area Maskless Photopolymerization (LAMP™) — a breakthrough technology for the tool-less, on-demand and affordable direct digital manufacturing (DDM) of ceramic cores and molds for investment casting of high-precision and high-performance components such as airfoils for turbine engines. Pre-commercialization funding to support DDM Systems' incubation was provided by VentureLab — a Georgia Institute of Technology business incubator, ranked #2 University Business Incubator in the world for 2013. The company launched commercialization activities in 2013 with a seed round from private investors. DDM Systems delivers custom, high-precision technology platforms and proprietary material formulations, in addition to high-end research and development services for the additive manufacturing and restoration of 3D industrial parts and components. DDM starts with intricate high-definition digital models, then creates tailored defect-free 3D designs, layer-by-layer, using patented technology and advanced ceramic materials for investment casting and metal powders for additive manufacturing to produce high-value metal components without tooling. The company also provides targeted testing, prototyping, and process optimization services for select customers keen on raising their benchmarks for innovation, cost, production time, performance, and sustainability. Visit http://www.ddmsys.com/ for more information about DDM Systems. DDM Systems' flagship ceramic production tool, the LAMP System CPT6060 has been selected by the jury for the 2016 HERMES Award to be a top 5 nominee and the only one from the United States. Recognized as one of the most prestigious international industrial awards worldwide, the HERMES award will be presented to the winner at the opening ceremony of the 2016 Hannover Messe in the presence of President Barack Obama and Chancellor Angela Merkel in the evening of Sunday April 24. 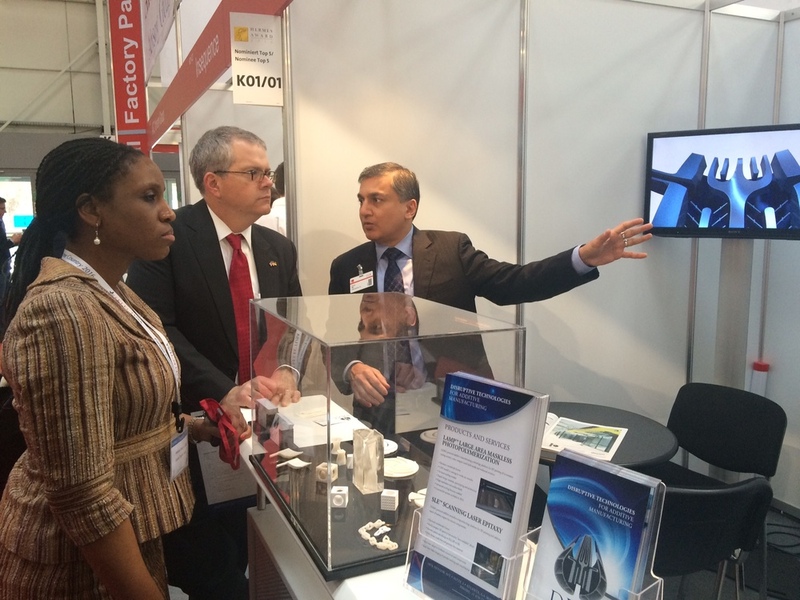 DDM Systems today announced it is part of the largest-ever U.S. delegation to Hannover Messe, the world’s foremost trade fair for industrial technology, taking place April 25-29, in Hannover, Germany. For the first time in the Fair’s history, the United States will be the Partner Country, a status that provides the more than 390 businesses and organizations in the U.S. delegation an unprecedented opportunity to be prominently featured throughout the event. President Obama will also participate in this year’s event, themed "Integrated Industry-Discover Solutions." DDM Systems will exhibit in the Digital Factory Pavilion at the show. DDM Systems delivers custom, high-precision technology platforms and proprietary material formulations, in addition to high-end research and development services for the additive manufacturing and restoration of 3D industrial parts and components. DDM starts with intricate high-definition digital models, then creates tailored defect-free 3D designs, layer-by-layer, using patented technology and advanced ceramic materials for investment casting and metal powders for additive manufacturing to produce high-value metal components without tooling. The company also provides targeted testing, prototyping, and process optimization services for select customers keen on raising their benchmarks for innovation, cost, production time, performance, and sustainability. New Video on Gas Turbine Hot-Section Component Repair with SLE posted on our Technologies page. DDM Systems will exhibit at RAPID 2015 in Long Beach, California.